Do ganglion cysts occur frequently? Can a ganglion cyst grow on a finger? Can ganglion cysts turn malignant? Does every ganglion cyst have to be treated? Is it therefore recommendable to wait and monitor the natural course of a ganglion cyst of the wrist? A ganglion cyst is a balloon-like cyst which in most cases is connected to a joint or a tendon sheath. The image shows a typical ganglion cyst of the wrist. 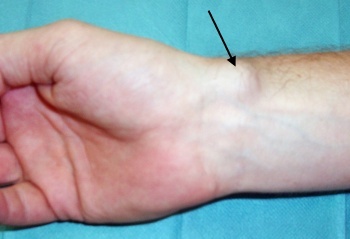 Most of the ganglion cysts – as shown in the image – develop on the back of the wrist. The position of the ganglion cyst in this area may however vary! You may picture the cyst similar to an air balloon. The mouthpiece of the air balloon is connected to the diseased tissue in the joint or the tendon sheath. An increased production of “joint grease” (synovial fluid) is produced within the diseased area. This “joint grease” now travels through the mouthpiece of the air balloon into the actual balloon and continuously expands it. 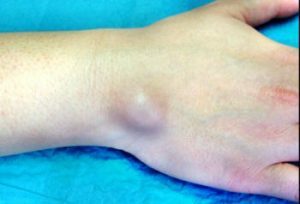 Only part of the balloon is visible or palpable in a ganglion cyst. In reality this balloon is a very thin tissue lining. The interior of the balloon as already mentioned, is filled with synovial fluid. Yes. Roughly half the tumorous swellings in a hand are ganglion cysts. They may appear in various locations. The most common one however is the back of the wrist. The second most frequent location typically is the flexion side of the wrist, precisely where the pulse can be taken. The image to the left shows such a ganglion cyst. Ganglion cysts in this position are generally built up the same way as those on the back of the wrist. Ganglion cysts along the radial artery however are a lot more challenging because of the vicinity of the artery. Ganglion cysts may grow on fingers. Here they are typically located on the grip side of the finger originating at the retainer system of the flexor tendon. These ganglions in medical terms are referred to as annular ligament cyst. No! Ganglion cysts are no real tumors. In medicine these swellings are referred to as pseudotumors, as there is no real new formation of cells involved. No! Particularly during the first weeks and months after the appearance of a ganglion cyst it is recommendable to wait and monitor the further natural development of the condition. Each affected patient should know that almost every second ganglion cyst will recede. Can children develop ganglion cysts of the wrist? Yes. Ganglion cysts can even be found on wrists of one- or two-year-old children! However, they are more frequent on adolescents and young adults. The image shows a ganglion cyst on a twelve-year-old boy. The ganglion is located on the extensor side of the wrist in a very common position. Very important before considering surgery: Ganglion cysts in children even more frequently than in adults will recede on their own! If you now consider that ganglions cysts may return, regardless of the selected therapy approach, it is definitely recommendable, particularly during the initial phase, to monitor the natural course of the condition over several months. There is one exception to this recommendation though: a ganglion cyst which causes considerable pressure on a nerve should be removed as soon as possible for the sake of the nerve. A physician should always be consulted for a reliable diagnose of a ganglion cyst because each swelling to the wrist may in fact also be a sign for a real tumor!